I hope I'm not the only one who thinks Emerald Spears is a parody of Ruby Spears. @abster I was just thinking that. I hope they sneak in some reference to the horrendous lionmen episode. As for QuakeWoman? I'm not entirley sure on this. Archie originally said that the MM universe was so big that they didn't have use for OC's. But with The faemale professor last issue and Now QuakeWoman, I fear we're heading into Archie Sonic-esque teritory. Oh God, I really have a bad feeling about this. 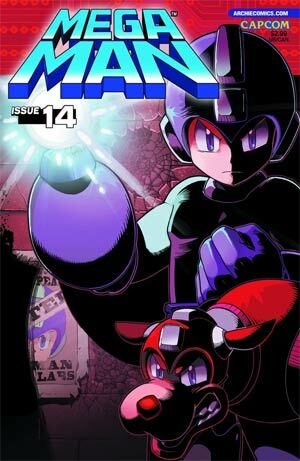 Archie skips Mega Man 3 completely for an original story and new characters... Please don't screw it up. It is. It obviously is. On the other hand... Quake Woman? Every continuity should be allowed at make at least one new robot master. And, hey ... it's not like the Dreamwave releases where only Heatman was featured in the story, right? And ... Superadventure without the MM3 guys? Awwwwwwwwwww ... Well, even if they were in there it'd likely be too much for these 4 issue story arcs. Already, even 8 robots seems like too much. (@UG_Bubbleman) Ugh, why do people keep thinking that they're skipping MM3? They're not. We've known since the beginning that the series is going to follow a "game adaptation, original arc, game adaptation, original arc, etc" template. Did you think that they skipped MM2 when they did the "Time Keeps Skipping" arc? They're just doing an original arc and setting up characters for the future. Have some patience. Protodude that's not how preview pages work. They won't come out until a few weeks before the comics release which is to say the middle of JUNE. We'll get the preview pages for Issue 11 in March next for instance. These solicitations are done four months out in advance the preview pages are not. Sorry, I meant to say months. Big Bertha the Robot Master? They're doing original, non game based stories?? SINCE WHEN?! Surprise at Quake Woman? Light's new love interest Dr. Lalinde is a roboticist, so she must have built a robot. Duh, people. Wouldn't that be Shake-Shake Woman?